1 Battery charger 12V (Sterling power). 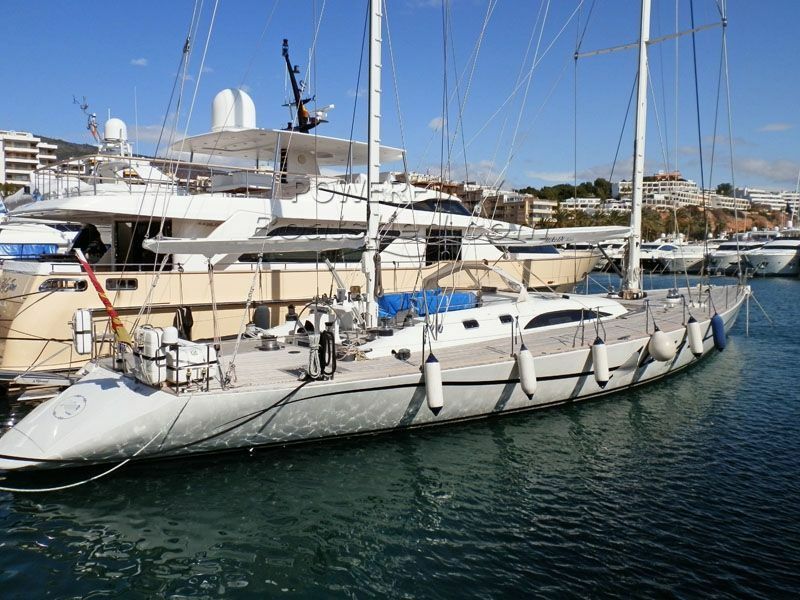 This big 27m long ketch came on the heels of the first Arrayan built by the Trehard yard in Antibes. It combined reduced displacement, greater and well-separated sail-areas, and construction in very reliable aluminium – and its successive owners were delighted. The forthcoming refit will provide a more up-to-date look without taking away any of its sailing qualities. Gilles Vaton, born 12 April 1952 in Quimper, France, started his career as a naval architect in André Mauric's prestigious Marseille office. He was involved in many innovative projects such as the keel-less Méridien and Kriter as well as the design of eventually mass-produced boats like the Jeanneau Mélody and the early Bénéteau Firsts. This 5-year term followed his working in England and France with Illingworth, Nicholson and Rouillard, a period in which he also crewed and then sailed solo in the Whitbread and Ostar 76 round-the-world races respectively. Around this time, he designed a one-tonner in collaboration with A. Maupas. He set up his own office in Marseilles in 1979, a commission to design a 40' yacht for the 'Beg Rohu' National Sailing School providing a solid start to his activities. In 1980, C. Heidsieck III brought success to Alain Gabbay, his good results giving the Vaton office further impetus. IOR maxis such as Coriolan and maxi cruise yachts like Arrayan, Blooper and Vogue followed on rapidly. New, innovative solutions applied to many maxi cruise yachts built in the 80s and 90s were consolidated the Vaton reputation. This Gilles Vaton Blooper Ketch has been personally photographed and viewed by a representative of Boatshed Palma. Click here for contact details.